This interesting name is of French origins and is a metonymic for a dealer in Herrings, or possibly a one who salted or smoked fish. 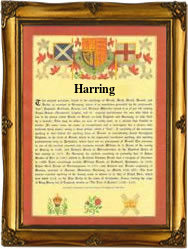 The surname derives from "hareng", a word introduced by the Normans after the 1066 invasion, the first recording being one hundred years later. Despite its apparently humble origins, name holders include Thomas Herring, Archbishop of Canterbury (1693-1759), and John Herring (1795-1865), stage coach drivers, members of the Society of British Artists, R.A. and painter for thirty two years of the winners of the St. Leger. Examples of the recordings include the following Anthony Herryng of Fleet Street, London on January 15th 1587, Elizabeth Hairring of Spitalfields, Stepney on January 30th 1770, a "link" spelling, whilst on July 31st 1808, Elizabeth Harring (who may be the same Elizabeth Hairring) married one John Fearus at St. Brides, London. The first recorded spelling of the family name is shown to be that of Ralph Hareng, which was dated 1166, The Pipe Rolls and register of Eynsham, during the reign of King Henry 11, "The Church Builder", 1154 - 1189. Surnames became necessary when governments introduced personal taxation. In England this was known as Poll Tax. Throughout the centuries, surnames in every country have continued to "develop" often leading to astonishing variants of the original spelling.